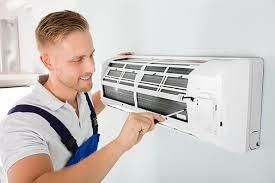 One of the most widely used electronic appliances across the globe is the air conditioning unit. These days, the majority of commercial and residential buildings have Aircon units to maintain a healthy atmosphere in the premise. The frequent use of the unit takes a toll on its internal parts which thus necessitates regular air conditioning maintenance and repair. One of the initial things that you need to carry out to keep the Aircon unit effective is air filter maintenance. Generally, you should examine the air filter at least once or twice a month. Based on the filter’s condition, you should have it cleaned or replaced. Avoiding regular cleaning of the air filter can result in several issues and have you pay a heavy sum on the repair work. Dirty air filter causes blockage in air flow thus making it difficult for the unit to provide proper cooling. Hence, cleaning the air filter and its grill on a regular basis can resolve such an issue and help your unit provide you with effective cooling. One more issue which an Aircon unit may face in the event of not maintaining it regularly is faulty cooling. In most cases, this issue happens because of the compressor not running despite the unit fan running properly. A significant thing you need you to need to check here is whether the wire of the compressor is shorted or burnt. Besides, this can also be owing to a defective capacitor or an overloading protector. These are complex issues, and unless you are a technical person, you should not try and fix them on your own. Hence, to stay away from such a problem, you should call a professional contractor who has the required experience and latest tools to fix this issue. If in case you are not receiving effective cooling from the Aircon air conditioning unit then it’s best to check the compressor. The compressor usually gets by outside factors such as heat, rain as well as leaves. Hence, it is suggested that if you are not using the air conditioner during winters or monsoon season then have it covered using a cloth to avoid any dirt from settling on it. Besides, you should also keep checking and examining the compressor regularly to detect an issue in the initial stages and have it fixed on time. Thus, in case of getting the best and most effective cooling from your Aircon unit, you need to follow these tips and maintain your system regularly.